Morrissey at the Paramount Theatre. By Andy Kroll. The first thing you notice at a Morrissey concert isn’t the man himself but his fans. Or at least that’s how it felt at a recent show at Oakland, California’s Paramount Theater, where Morrissey appeared in support of his latest album, a collection of B-sides titled Swords. Their hair styled circa The Smiths, clad in blue-jean rockabilly chic, Morrissey’s fans still adore him, deify him, cram at the foot of the stage and thrust their hands toward him for just a brush, a touch. Some gave Morrissey hand-painted signs; others clambered up onstage and dashed past security guards to wrap their arms around their beloved Moz. Humility aside, Morrissey’s latest tour suggests that the legend—his iconic, pomaded up-do thinning and graying on top—hasn’t lost his edginess. Backed by an identically dressed five-piece band and the admonishing image of a how-can-you-eat-your-pudding-if-you-don’t-eat-your-meat-looking Brit, the concert opened with a pure rock, power-chord heavy take on Smiths hit “This Charming Man.” From there, the show cut a through-line across the Morrissey oeuvre with 17 songs old and new. While the Smiths hits were kept to a minimum (“How Soon Is Now?” a highlight), the band’s choice of Morrissey solo songs—an accordion-infused “Why Don’t You Find Out for Yourself,” “The Loop,” “First of the Gang to Die” as an encore—kept the crowd plenty entertained. Entertained but not necessarily intrigued. 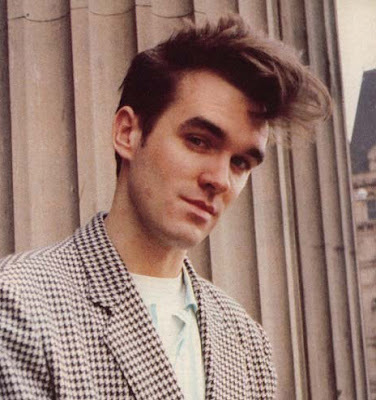 Because if there’s one thing a Morrissey or Smiths song accomplishes, it is leaving you not just humming along but faintly curious, startled even, furrowing the brow. It was either a particular line (“We hate it when our friends become successful” or “You’re the one for me, Fatty”) or a particular guitar riff or effect. Here what we heard was mostly Modern Rock Morrissey—a lot of heavy, distorted chords, busy drumming, even (gasp!) the occasional guitar solo. Sure, he sounded edgy—but in a way hardly benefitting the king (queen, if you prefer) of loneliness, irony, melancholy. But his fans didn’t seem to care. During the encore, they mobbed the stage, brushing off security guards with Barry Sanders-esque swim moves and rushing toward their idol. As honest and thankful as he seemed, Morrissey’s generosity by that point had run out: After quickly wrapping up his final song, he dashed offstage for good. Just like that, the legend made his exit.